So I used the No-Knead bread recipe from the NY Times. And it worked! Very easy, truly. The bread itself is comparable to something you’d buy from a bakery. 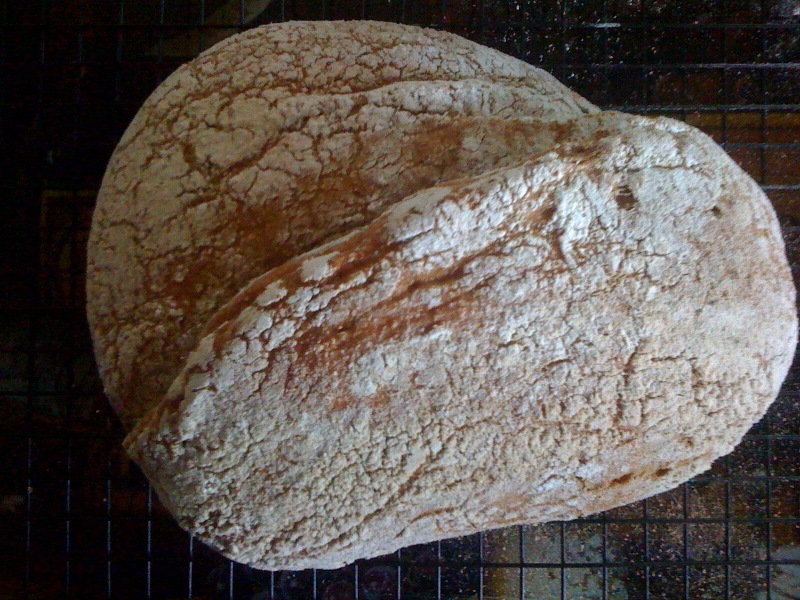 I used wholemeal flour, which means the loaf is a bit whole-mealy-boring tasting, so next time I’ll try to put some whole grains in there as well. But it’s certainly edible, which amazes me. All this cooking, aside from indulging in something I absolutely love, is a bit of an experiment in what it’s actually possible to make oneself. And in finding out what actually goes into making food I would otherwise buy from the supermarket. This, of course, is related to the video I posted yesterday. So it’s research for a story, sort of. Oh, and the fact that there’s something incredibly satisfying about having a navy blue apron covered in flour handprints.